We’d love your help. Let us know what’s wrong with this preview of John Curtin's War The coming of war in the Pacific, and reinventing Australia by John Edwards. John Curtin became Australia’s Prime Minister eight weeks before Japan launched war in the Pacific. Curtin’s struggle for power against Joe Lyons and Bob Menzies, his dramatic use of it when he took office in October 1941, and his determination to be heard in Washington and London as Japan advanced, is a political epic unmatched in Australian experience. As Japan sank much John Curtin became Australia’s Prime Minister eight weeks before Japan launched war in the Pacific. Curtin’s struggle for power against Joe Lyons and Bob Menzies, his dramatic use of it when he took office in October 1941, and his determination to be heard in Washington and London as Japan advanced, is a political epic unmatched in Australian experience. As Japan sank much of the Allied navy, advanced on the great British naval base at Singapore, and seized Australian territories in New Guinea, Curtin remade Australia. 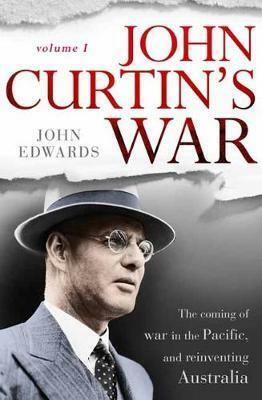 Using much new material John Edwards’ vivid, landmark biography places Curtin as a man of his times, puzzling through he immense changes in Australia and its region released by the mighty shock of the Pacific War. It shows Curtin not as a hero and certainly not as a villain but as the pivotal figure making his uncertain way between what Australia was, and what it would become. It locates the turning point in Australian history not at Gallipoli or the Western Front or even Federation but in the Pacific War and in Curtin’s Prime Ministership. To ask other readers questions about John Curtin's War The coming of war in the Pacific, and reinventing Australia, please sign up. John Edwards is Modern Languages Faculty Research Fellow in Spanish, University of Oxford. He lives in Oxford, UK.